This recipe is so easy to make, but your guests will think you spent all day in the kitchen! Delicious! 1. To make the almond filling, place all the ingredients together in a large bowl and bind together with your hands to form a soft marzipan (alternatively you can use a food processor), making sure the mixture is not sticky. 2. 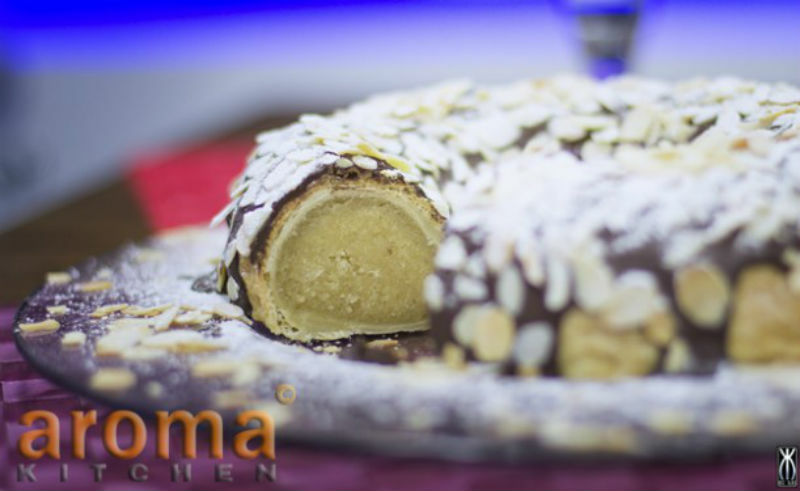 Roll the almond filling into a thick long sausage, about 5cm thick and put aside. 3. Next, roll out the puff pastry on a floured surface into a 12cm wide long strip. Brush the pastry with water and place the almond filling on top. 4. Roll up in the pastry, ensuring to close the puff pastry seams together well. 5. Join the 2 ends together to form a ring and place on a large baking tray covered with nonstick paper. 6. Bake in the oven for 25-30 minutes, or until the puff pastry is cooked through. Remove from the oven and allow to cool down completely. 7. When cooled down, brush the almond ring all over with the melted chocolate and cover with the toasted almonds, sticking them to the chocolate. 8. Allow the chocolate to harden before dusting all over with icing sugar.